Ubuntu 10.04, Lucid Lynx will be bringing more than faster boot times and open drivers to users this spring, it will radiate "Light" throughout the community with a face lift for the future. Within the Ubuntu Community there is a wiki for *every* thing it seems and the new brand is no different so let's see what the wiki tells us about this new and polished look and feel of the Ubuntu Brand. The Ubuntu Wiki,Brand, A Fresh Look for Ubuntu, informs us -- The new style of Ubuntu is driven by the theme "Light". We've developed a comprehensive set of visual guidelines and treatments that reflect that style, and are updating key assets like the logo accordingly. The new theme takes effect in 10.04 LTS and will define our look and feel for several years. 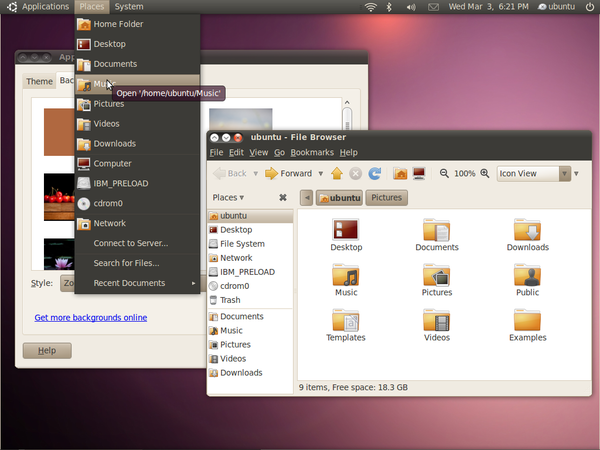 The new style in Ubuntu is inspired by the idea of "Light". We're drawn to Light because it denotes both warmth and clarity, and intrigued by the idea that "light" is a good value in software. Good software is "light" in the sense that it uses your resources efficiently, runs quickly, and can easily be reshaped as needed. Ubuntu represents a break with the bloatware of proprietary operating systems and an opportunity to delight to those who use computers for work and play. More and more of our communications are powered by light, and in future, our processing power will depend on our ability to work with light, too. Visually, light is beautiful, light is ethereal, light brings clarity and comfort. Historical perspective: From 2004-2010, the theme in Ubuntu was "Human". Our tagline was "Linux for Human Beings" and we used a palette reflective of the full range of humanity. Our focus as a project was bringing Linux from the data center into the lives of our friends and global family. As you can see below the desktop is lightning up as well. 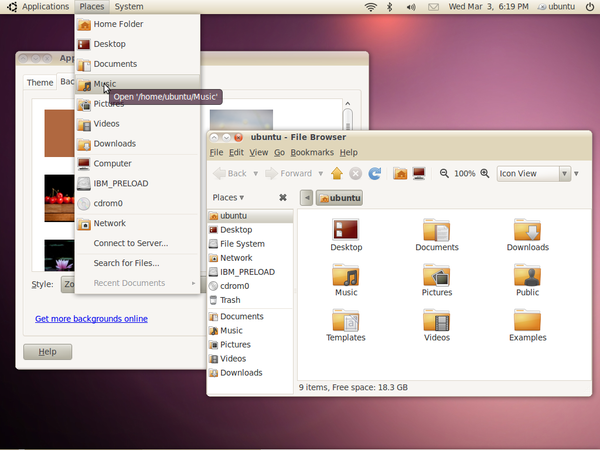 Lets look as some screen shots and see what illuminating themes will be glowing from the desktop in Ubuntu 10.04. The look of the CD's isn't finalized yet but you can definitely see the direction the look is going in. Here's is what the wiki documentation had to say about this - This isn't the CD cover for the next release but shows a concept for it. We feel that the new palette of colours could help us create a bold design that helps us stand out from other operating systems. When asked what this new brand symbolizes for Jono Bacon, as the Ubuntu Community Manager he said, "For me it symbolizes who we are, where we came from, and where we are going; we are serious about bringing free software to the masses." Elizabeth Krumbach is an Ubuntu Community Council member, Ubuntu America's Membership Board member, a US Teams mentor, as well as an ubuntu user and contributor. Elizabeth is also an instrumental part of the Ubuntu Women project, playing a key role in making the project what it is today. I was able to catch up with her after the re-branding announcement and when asked, "As a person who continually shines in the Ubuntu Community, as a mentor, leader, and role model blazing a path for others to follow what does the new "Light" theme mean to you? Elizabeth Krumbach answers that questions this way. "For as long as I've been involved, the communities built around Linux in general have been exciting communities to be involved with. Ubuntu has always been a shining example of this positive community spirit and I think this new "Light" theme goes one step further to communicate that to users beyond those who have had the opportunity to become deeply involved with the Ubuntu project." She goes on to say, "I would also like the mention that I'm pleased that Canonical decided to inform and engage key members of the community in this re-branding, it's been exciting to see members of projects like Xubuntu be included and able to offer re-branding for their releases as well." As for me - I like the new "light" theme not only for the new look of the Ubuntu Brand, with polished new features, lightning fast boot times, and ease in use, but also what it means for the Ubuntu Community. If Light as mentioned in the wiki is -- Visually, light is beautiful, light is ethereal, light brings clarity and comfort -- and from 2004 to 2010 Ubuntu has been "Linux for human Beings" -- I would now ask has the time come where we can say - "Ubuntu - Linux Illuminated" one user at a time. So what are you waiting for you know you want to see the new look and feel so mark you calendars and on April 29, 2010 , download your copy of Ubuntu 10.04. As the project manager for a computer refurbishing project that supports Ubuntu on a large range of used hardware I have found that Ubuntu 9.10 has been the worst Ubuntu yet! There are video driver issues. We initially had an issue where GDM2 didn't have a timed login feature (which has since been fixed). We ran into issues with other hardware that previously worked on other versions of Ubuntu. On the plus side we've found much better support for printers and printing (though we still have to configure the odd printer, and some still do not/will not work). Gnome has been criticized in the past for dumbing down the user interface, for hiding things it shouldn't. Canonical/Ubuntu seem to be dumbing down the user interface even more. Since we're primarily a PC shop (we do have a few Macs), I decided to sit some volunteers down in front of a Mac running OS X (I think it was 10.2, the iMac was only a 600MHz box) and ask them to do a variety of tasks. Some of the tasks that they could figure out in Linux and Windows they couldn't figure out how to do on Mac OS X. Easy to use? Not necessarily... I think it's the same as any operating system, if you have some experience with the OS, some good guidance, the system is easy to use. I think it's wrong that Canonical/Ubuntu tries to clone Mac OS X. Before doing anything the team should be fixing problems with 9.10. This does not seem to be a big priority, especially for the user interface, they want to make it pretty, but not functional. As an example: it appears that the plan is to continue to use a broken GDM2. GDM2 needs to be expanded to include tools to re-implement the simple login prompt of GDM (which went away when Ubuntu moved to GDM in 9.10). Just imagine a school or business with a 1,000 faces in the face browser? GDM2 is a low priority in the Ubuntu Lucid issue cue, it doesn't look like it's going to get fixed. With Lucid just around the corner, at this point it looks like a big disappointment. I tried the alpha on a machine equipped with an 256MB ATI AGP video card. After running the upgrade the screen wobbled (when I changed the refresh rate within the preferences it fixed the problem, but only while logged in, not for GDM2), my mouse indicator disappeared (but the mouse still worked), it simply wasn't usable. Of course this is the third stage of an Alpha release so I didn't expect great results, but it does appear there is a lot that needs to be worked on still. With the release date in just over a month I'm thinking there is either going to be a lot of long code sprints, the release date will get pushed back, or it will get released as a buggy pretty-boy. Having used Ubuntu since 4.10, this is the first time I've really had a lot of harsh things to say about it. A few things in 9.10 are great, but the vast majority of it seems to be a mess. Canonical/Ubuntu need to forget about simplifying the UI if it means they're going to take away functionality.